"This plate is very typical of the marsh scenery in this delightful country, where water-ways take the place of hedges. Beneath a sky in which float light cumuli, spreads the marsh, heated by a noontide sun. 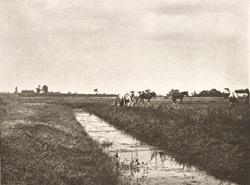 A dike in which grows masses of arrow-head takes the eye up to a few haycocks on the left, beyond which stands a lone marsh-farm. On the right graze some cattle and horses, some of which stand lazily contemplating the marsh in the quiet still heat. In that dike lies a pike basking, and as we approach he will start off with a splash. There is a dreamy, sleepy feeling which seems to pervade all things, even the grazing animals. The rich dark browns and greens of the grasses, the bright blue of the water, the fresh greens of the newly-cropped marshes, and the low-toned reds of the farm buildings, all help to produce a soothing sensation, and act on us like a charm."